what that pikachu made of? Completely different game (well sort of) But there will be a new Guilty Gear in the near future. Hopefully they wont noobify it. Though i do not like the idea of a crossover between GG and BB. It'd be clone battles after clone battles i mean what the hell would be the point?! since I am going back to school next week I hope my dad can take me to the Arcade Infinity so I can play Continuum Shift I missed doing Ragna The Bloodedge's Belial edge on people when I was there and hakumens scream when he swings that sword or says "zero" hyaaa. what the hell no one cares about Guilty Gear anymore? New patch details. Its already out in Japan but not in America. Some of the sentences are a little off. Blame Google translator. -The standby of automatic entering a room function is added to the room under fighting in the Player Match room. -In Player Match, the problem of freezing it when the opponent cuts the line according to specific timing connecting the room is corrected. -The data of the player externals in which this phenomenon has happened lets me reset the value in 0 now. -Adjustment of SE volume of "Baden-Baden Lily" of Rachel = [aruka-do] and "Sword iris"
-In a specific lot of the main body, the problem that the frame rate falls extremely in the training mode is corrected. So yeah Today I went to the Arcade Infinity to play Blazblue Continuum Shift and it was awesome, I was owning when I started playing, but then I got beaten by an Arakune player after 12 wins and there was a Tournament I entered But Disqualified myself because my dad said I had to go it was because my Bros. were there, tried to convince him since I was still in the tourney but oh well hopefully there will be another tournament soon, there some pretty good players there, good thing there is 2 CS machines, there were people from the tourney playing each other for practice, it was awesome, Ragna is going to be my main in CS. Yep. Official comic books. Most likely to be lol bad. Nah they are not out yet, these are just preview scans from BlazBlue's Facebook page. Theyve been there for a while now it seems and this is the first time ive seen them aswell. *Stare* LOLZ. and oh okay damn. 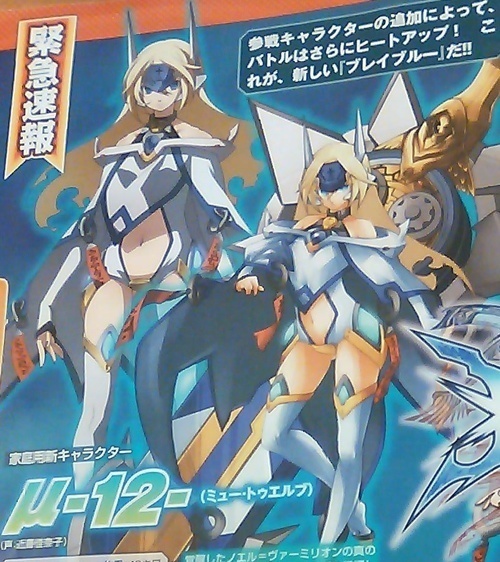 o_O whoa another cyborg and it's Noel!! Too awesome her outfit resembles V-13 but sexier. Word of a console version of BlazBlue Continuum Shift leaked out last week. Today, thanks to the source of the original leak, Famitsu, we got confirmation. The arcade BlazBlue sequel is coming to PS3 and Xbox 360. The home version will feature all the new additions to the arcade version, including playable Tsubaki Yayoi and Hazama. Players can also look forward to a new character, u-12 (myu-12), and new stages. Modes of play for this second console BlazBlue include a strategic Legion Mode where you face off against enemies on a map, and a fully voiced tutorial mode. Newcomers will be able to select a Beginners control option, which simplifies special move input. The game's network mode is also seeing various as-yet unspecified improvements. BlazBlue Continuum Shift hits the Japanese PS3 and Xbox 360 this summer. An international release has yet to be announced. Damn it i wont be able to get the ultimate edition. Im too low on cash. Ill most likely get the standard edition instead. I hope I do I am still thinking about it if I just save my money that my mom gives me for food I could buy it on Saturday I will pay FF13 fully only 40 more dollars and Pre-order GOW 3 and BB2.